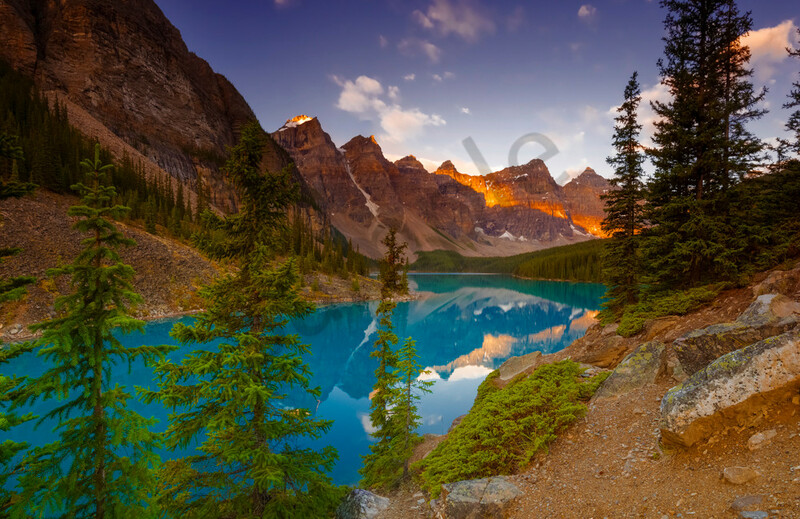 The Sun glistens gold on the Peaks above iconic Moraine Lake. Alpin Glow in the early morning just adds to the color of stunning Moraine Lake. Sitting at the foot of the Wenkchemna Peaks, Moriane Lake gets it's intriguing color from the run off and sediments of minerals and particles suspended in the water as it flows down to the lake. Once in the lake, the minerals and sediment start to settle and they reflect the light with this signature color of lakes in the Canadian Rockies. The Alpin glow this morning served as a great contrast to make the whole scene part of the breath taking landscape of Banff National Park and the Canadian Rockies.